Over the past twelve months, some bidders have paid amazing prices for stainless steel and gold plate 'used' and 'new old stock' Omega beads of rice bracelets listed through eBay. 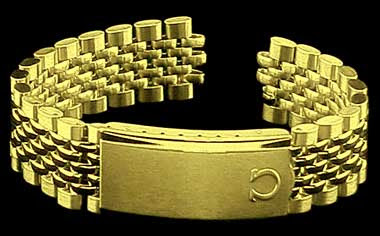 Its not unheard of to see gold plate BORs sell for over USD$350.00 and for stainless bracelets to sell in the 200 plus range. Most of the bracelets offered are NOT old stock produced in the 1960s. How can you tell? Well, they didnt have bar codes in the 60s! This proves that the bracelets are recently manufactured......... and here's the rub, they are still available today at prices well below that being reached on eBay auctions. For example, a new BOR stainless steel bracelet can be purchased for USD$147.00 inclusive of end pieces. The gold plated version is available at USD$216.00. Unless you can prove that a bracelet on offer is a genuine 1960s BOR, why would you choose to pay often nearly double the retail price on eBay when you can buy them freely from Omega agents? The above post was published in 2007 when BOR bracelets were more plentiful and offered at the prices mentioned above at Otto Frei. Since then, supplies have diminished and prices have risen accordingly. i am confused.. are you saying that the BOR offered by teds or orfei are or are not "new old stock"
IN most cases, BOR bracelets offered are new, new stock. Some dealers come across a few NOS bracelets from time to time, usually after the passing of an old watch maker, etc., but new BOR bracelets are still in the Omega inventory. Just found this searching for a bracelet for my old 53 Seamaster. Thats the good thing about search engines, they still pick up relevant stuff years after publication. did Beads of Rice bracelets ever come in solid gold? Yes they did. I have had several of them, some years back. The only ones I have seenare 7 rows across. Not to be confused with the solid gold Gran Luxe brick bracelets. The problem with these new bracelets is that they are deep yellow in color and CLASH with the older Connies and Seamasters. Best to get an older gold filled bracelet that closely matches color. The gold is different to the original 14 karat gold cap on the watch. Also the original bracelets were often proper gold cap, or rolled gold in 14k, and not gold plated. HI, thanks for your article here. I have a 1950s/1960s Seamaster with case number 2849, and I am really keen to get a beads of rice bracelet for it, but I can't find (even on Otto Frei's website) the correct endlinks for it! Is it possible that no endlinks fit this case? There are different sized end pieces for BORs in both nine row and seven row versions. I assume you're looking for a seven row. 511s won't fit the longer lugged Seamasters as they have the same end pieces as BORs for the 168.005, which I cant recall the number from memory. Click on Teds Vintage watches under sellers as Ted often has bracelets and may well know the end pieces you are looking for. BORs for Seamasters didnt come along until the Gerald Genta designed Seamaster Special. You suggested Ted's vintage watches. 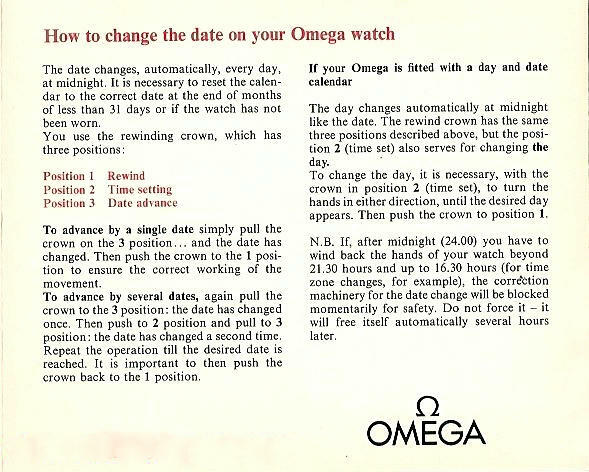 I'm looking at what they claim to be NOS 9 row BoR (http://www.tedsvintagewatches.com/collection/04137_01.htm) and I've noticed that the Omega logo on the clasp seems slightly different, with sharp edges, rather than a curve. Do you know anything about this? Is it genuine? looks ok to me. I think that the way it was photographed has accentuated the curve and made it more extreme. Email Ted and ask him if the logo in real life is rounder. I think it is. I have seen different ways of counting the row of beads on a BOR. Some count the end beads (the two that are bigger than the ones in the middle) and some only count the middle beads. Which is the correct way? My experience has been that bracelets are counted in'rows' and hence the end rows are also counted, thus seven and nine row BORs. Thanks for the clarification. I have a stainless steel Seamaster Automatic with a 7 row 1036 No.12 bracelet. I like to leave this watch to my one of my kids but they all have bigger wrists than I have. Any suggestions on where/how to get some extra links? Extra links are scarce and you may may have to purchase another bracelet and somewhat painstakingly add the links. Before you consider that, try Teds Vintage Watches (link opposite under vintage dealers) as I know Ted did have some extra pieces at one time. and then has OMEGA on right of this text. Any help would be wonderful - she would like us to sell the bracelet so I've been researching but I'm not sure about the stainless part of the clasp being original? This one sounds to me like a US made version Jenny. Good news that it is gold filled and not plated as the gold is thicker. Gold filled bracelets did indeed have the stainless steel hidden parts of the clasp and so it sounds pretty complete to me. Desmond - thank you so much for your quick response - I sincerely appreciate your help and expertise. I see these bracelets ranging from $100-$350 on eBay. In your opinion, what would the best price be for a buyer and seller to agree on? Thank you so much for your help! I am searching for the gold BOR bracelet that goes with the vintage Seamaster I have that is from the 60s. Any ideas, please? Huge sentimental value to me. Gold plated ones come up on ebay from time to time and new ones are still available from Otto Frei ( see http://www.ofrei.com/page1281.html ) The price has increased quite substantially since this post was originally published. If you are looking for a solid gold example, you would need to trawl all the auction sites and the For Sale sections of OMega and other watch fora. They are very scarce. I recently purchased a Constellation on a GOR bracelet, any tips on adjusting it? I was able to easily remove the pins but there seems to be a bushing in there holding everything together. The clasp micro adjuster is all the way, so no adjustment left there. Thanks for all the info you provide! From memory, Paul, and using a proper pin-removing device, the bush comes out too. I assume you mean BOR bracelet, and if so, and if you're a dab hand at a little basic metalwork, you can pry open the beads so as to remove some rows and then carefully bend them back again, using long nose pliers as a kind of anvil to prevent the beads buckling in. I have a very interesting BOR bracelet. Not only is mine a 7 row, but it has a ratchet deployment clasp. Do you know any information about this type? I have only seen a few out there. I have two different bracelets. I plan on selling one, but would like to sell the least rare of the two. Hi, Do you know if beads of rice bracelet can still be found at Omega's retailers ?